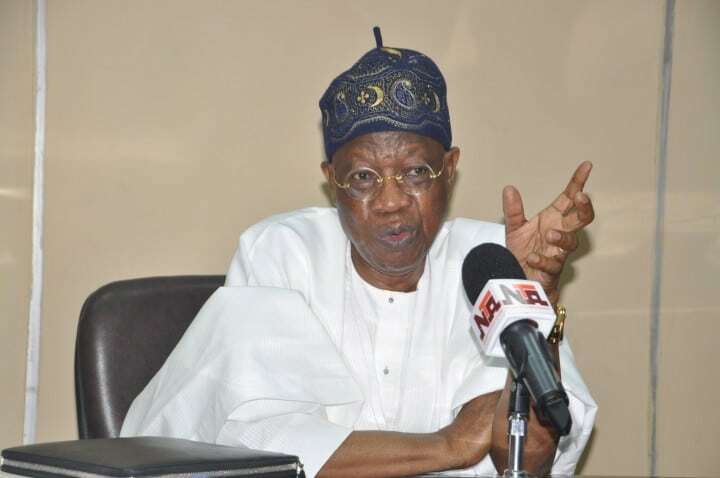 The Minster of Information and Culture, Alhaji Lai Mohammed held a press conference on Friday in Abuja, to update the media on efforts made so far by the President Muhammadu Buhari lead adminstration to rescue the abducted Chibok Girls. The Minister said that since the inception of the present adminstration, the security agencies have been saddled with the responsibility of dealing with the threat of terrorism which has ravaged most parts of the Northern region. He reminded Nigerians of the physical destruction of communities and strategic institutions carried out by the terrorist and also the abduction of women and children in the affected parts. “Most painful was the abduction of the School girls in Chibok at the twilight of the past administration in 2014. “When Mr. President assumed leadership of this country, he immediately directed security agencies to urgently fashion out strategies to trace, locate and ensure the safe and successful release of the Chibok girls. “This was the mandate given to security agencies.” He said. According to him, upon the directive given to security agencies, comprising of the Military, Police and the DSS, they commenced action in accordance with the directive in June 2015. Members of the public may recall that when the present administration came on board, Mr. President pledged to Nigerians to ensure the security of lives and property of every Nigerian, provide employment for the nation’s teeming youths and fight corruption. Since that time, the security agencies have been saddled with the responsibility of dealing with the threat of terrorism which has ravaged most parts of the Northern region. You will also recall that from the physical destruction of communities and strategic institutions, the terrorist elements also engaged in abduction of women and children in the affected parts. Most painful was the abduction of the School girls in Chibok at the twilight of the past administration in 2014. When Mr. President assumed leadership of this country, he immediately directed security agencies to urgently fashion out strategies to trace, locate and ensure the safe and successful release of the Chibok girls. This was the mandate given to security agencies. Gentlemen, it was consequent upon this directive that the security agencies, comprising of the Nigerian Army, Air Force, Navy, Police and the DSS, commenced action in June 2015. It was therefore found that in the midst of these strong competing interests and unnecessary rivalries, nothing was achieved before the 2015 handover date. It was based on these that the security agencies set out to work for the release of the girls.First, there was the need to identify those with relevant intelligence on the groups holding the girls, as well as establish sources of contact in touch with the group. This exercise was found not to be an easy task. On those holding the Chibok girls, there was also a high level of mistrust, as they too found many approaches or groups claiming to be in touch with them as false or unreliable. In this new bid, many offers ranging from credible, not credible to outright off-mark information came to the Government. Some international bodies and countries also provided leads. It was out of this that relevant security agencies were able to strike a chord. By the third week of July 2015, a contact group was in touch with credible assets who had the reach, and who attested to the fact that some of the Chibok girls were alive. Mr. President was then briefed of these assets and intelligence and he gave his assent for further negotiations on the Chibok girls. Precisely on 17th July, 2015, the DSS opened negotiations process with the group holding the Chibok girls. However, in return for the release of some of these girls, the group also made some demands. These included the release of some of their fighters arrested including some involved in major terrorist actions, resulting in several fatalities, and others who were experts in manufacture of locally assembled explosives. This was difficult to accept, but appropriate security agencies had to again inform Mr. President of these demands, and its viewed implications. Again Mr. President gave his assent believing that the overall release of these girls remains paramount and sacrosanct.Meanwhile, following the above development, Government and the security agencies had sufficient leverage to work out the modalities of the swap. These included creating the safe haven, or necessary place of swap and working out the logistic details. Based on this, the DSS availed other critical sister agencies of this new situation. Immediately, the Nigerian Army and the Air Force sent some specialists to commence a detailed arrangement for the swap. This was during the last week of July 2015 and 1stweek of August 2015. The officers representing the various agencies worked out the logistic details, such as the number of persons to be swapped i.e. number of girls and detainees to be exchanged, the vehicles and aircraft, as well as safeguards, i.e. safety of the persons, including the location of the swap.When it was finally agreed by all parties, Mr. President was again informed that the preparations were concluded, and the first step for the swap would commence on 1stAugust, 2015. Mr. President robustly gave his approval. On 4th August, 2015, the persons who were to be part of the swap arrangements and all others involved in the operation were transported to Maiduguri, Borno State. This team, with the lead facilitator, continued the contact with the group holding the Chibok girls. The Service was able to further prove to the group its sincerity, as it established communication contact between it and its detained members. All things were in place for the swap which was mutually agreed. Expectations were high. Unfortunately, after more than two (2) weeks of negotiation and bargains, the group, just at the dying moments, issued new set of demands, never bargained for or discussed by the group before the movement to Maiduguri. All this while, the security agencies waited patiently. This development stalled what would have been the first release process of the Chibok girls.It may be important to note that in spite of this setback, the government and the security agencies have not relented in the bid to ensure that the Chibok girls are released safely. By the month of November, precisely 13th November, 2015, another fresh negotiation process with the group was initiated. This time, there was the need to discuss a fresh component in other to avoid issues that had stalled the former arrangement. There were however some problems that many may not discern, but should be expected in this kind of situation. Some critical persons within the group who played such vital role in August, 2015 were discovered to be dead during combat action or as a result of the emerging rift amongst members of the group then. These two factors delayed the process. In spite of these, negotiation continued on new modalities.By 30th November, 2015 it was becoming glaring that the division amongst the group was more profound. This affected the swap process. By 10th December, 2015, another negotiation process was in place, but this failed to achieve results because of the varying demands by the group.Gentlemen of the press, the security agencies since the beginning of 2016 have not only remained committed but have also taken the lead to resolve the Chibok girls’ issue. In spite of the current division amongst members of the terrorist group, which has seriously affected efforts to release the girls, renewed efforts have commenced using our trusted assets and facilitators. However, this job requires diligence and ability to deal with a group that can easily change its demands without notice.Officers and men have sacrificed their time and energy, and some have already paid the supreme price since the abduction of the Chibok girls, fighting for the safe release of the girls. Many friendly countries and organizations have equally been very forthcoming in providing their human and technological resources to assist in the process. They are still doing so. We cannot as a nation ignore these sacrifices.The Government and its security agencies remain committed to ensuring that the Chibok girls are safely released in fulfillment of the Presidential mandate. Let me emphasise that Government appreciates the resilience of Nigerians in the fight against insurgency and terrorism, and will continue to call on fellow Nigerians to hold that much is ahead and therefore support Mr. President’s resolve on this matter. I cannot end this without appealing to the parents and relatives of the Chibok girls. We are with you; we feel your pains and shall not relent until we succeed in bringing home our girls and every other citizen abducted by the group. It is important to appeal to all those who have shown concern in resolving this matter to continue to trust the efforts of Government to deal with the situation.